This week saw the Consumer Electronics Show open its doors in Las Vegas, Nevada, giving the public a chance to get a first-hand look at the latest technology in computing, gadgets and software. It is also an opportunity to witness new innovations in the world of motoring, with numerous outlets displaying various automotive products of the possible and definite future. 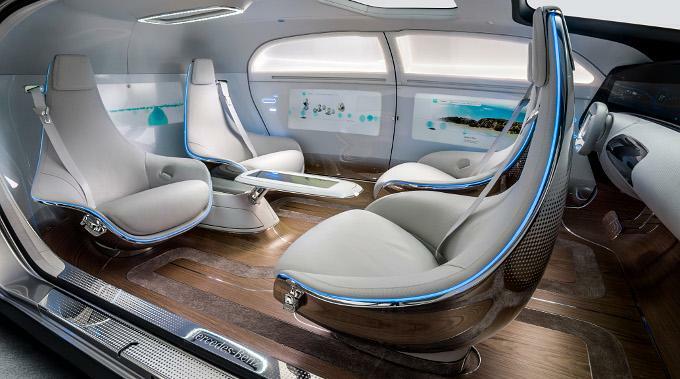 To call this a car would probably be pushing it a little, instead, think of it as an autonomous pod that Mercedes sees as the future of motoring. An incredibly spacious and luxurious interior reflects the German manufacturer’s aim to take you to your destination in complete comfort and in an environment more akin to a living area. Swivelling seats in the front and back create rather sociable surroundings, while touchscreens run along the front and side panels that adhere to gestures and eye-tracking to give us an idea of the future family car. 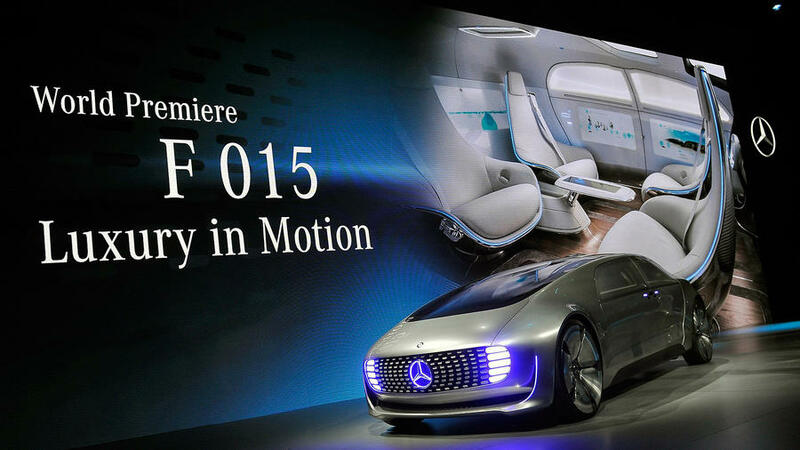 The F 015’s autonomous technology utilises some rather impressive technology on its exterior, where large LED fields at the front and rear communicate to others as to which driving mode it is in – autonomous or manual. LEDs at the rear will also tell those driving behind to STOP or SLOW. Perhaps most impressive is the Mercedes’ ability to park itself after dropping off its passengers, just like the firm’s Munich compatriots BMW. It can achieve this by using Mercedes’ ‘Extended Sense’ technology that enables the car to know its location by millimetres. Mercedes has also incorporated technology into the F 015 that helps it detect pedestrians waiting to cross the road; the vehicle will halt when registering a person at the side of the road and then scan the surroundings to check if it’s safe for the pedestrian to cross. Following this, the car will use a high-precision laser system to project a virtual crosswalk that is coupled with a “Please go ahead” audio prompt for the pedestrian to cross. The Golf R has already taken many, many plaudits and Volkswagen is keen to continue to prove its worth, with the R Touch a showcase in the future of dashboard architecture and technology. Volkswagen is using the Golf R Touch as a prospective way of doing away with traditional controls and have a car’s cabin more reflective of that of our smartphone and tablet technology. Three separate display units are set inside a modified version of the Standard R’s dash and shows off a combination of gesture and touch controls. A 12.3-inch digital instrument panel is also featured and is similar to that on the new Passat. An example of the R Touch’s technology sees the gesture control unit utilise a 3D camera mounted within the roof lining; when the driver touches the roof, the digital controls for the sunroof appear in the main 12.8-inch display. Following this, a hand movement from front to rear will initiate the opening of the sunroof, with the reverse movement closing it. The R Touch has an extensive choice of displays and colour schemes in order to offer personalisation throughout, with ambient lighting providing a generous 16.7 million different colour combinations. 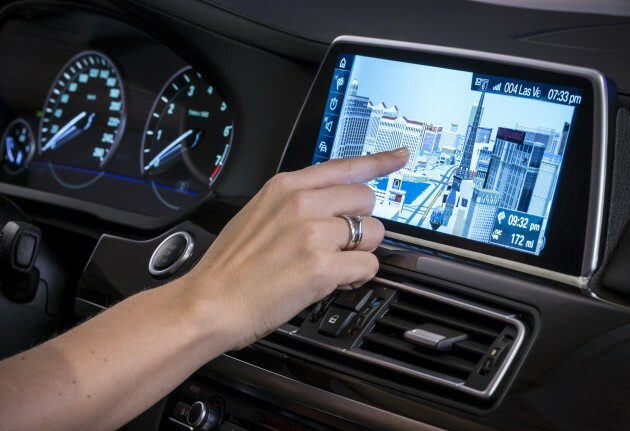 It’s been a long time coming, but BMW has finally added touchscreen technology to its iDrive facility – nearly 15 years after its inception. BMW revolutionised in-car multimedia back in 2001 and has somewhat inevitably brought it touchscreen abilities, after avoiding its introduction with various shortcut keys over its lifespan. The firm’s rivals followed its example throughout the years and now BMW has had to catch up with them, with Tesla also having recent major influence over premium cabin technology. Like Volkswagen, BMW will also bring in gesture-based controls.